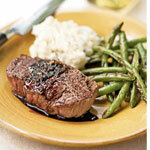 Pair steak with classic sides like mashed potatoes and steamed green beans. The menu comes together easily enough for a weeknight meal, but it's sophisticated enough to share with guests. Just love this recipe Maggie and I think you will too! Sprinkle both sides of steaks evenly with salt and black pepper. Heat a large nonstick skillet over medium-high heat. Coat pan with cooking spray. Add steaks to pan; cook 3 minutes on each side or until desired degree of doneness. Remove steaks from pan; keep warm.